The Wargrave Local History Society meeting in January was an illustrated talk by Rob Needham, vice-captain of the Sonning tower, on the history of Wargrave Bells and Bell Ringing. Bell ringing began in churches in the late 900s, and their use gradually increased until the 16th century. They were used not only for services, but also for secular needs, such as giving notice of village events, or sounding the curfew. However, their use was much reduced in the Reformation, as the King wanted to simplify church services. However, as the bells were generally maintained by the local town council or Lord of the Manor, they were generally not considered to be 'church property', and were allowed to remain in place. The secular use of bells increased, however, and often, as in Norwich, the ringers were paid by the local Guildhall. The 'Golden Age' of ringing was from the 1700s to about 1850, when many ringing societies were formed, who had regular meetings, usually in the local pub for a meal and drink - and the local publican would often sponsor the ringing contests between the various highly competitive teams. People would 'follow' their team much as today they might support the local football team! Ringing was considered good exercise - both physically and mentally. Some gentlemen even installed ringing machines to get such exercise without annoying their neighbours - the machine included several long bars with heavy weights at each end, but made no sound - hence were 'dumb bells'. By the early 1800s, however, bell ringers were getting a bad name, as the 'educated and gentry' were being replaced by 'less desirable members of society' - ringing being popular with hard working labourers who wanted some extra income - but had little interest in church matters. So, in the mid 19th century, the church decided to 'clean up' bell ringing - many clergy themselves joining the ringing teams, and by the end of the century, women became ringers for the first time. At Wargrave, the church tower dates from 1635, and contained a ring of six bells. The treble, second and third were inscribed "Henry Knight Made Mee 1669", (some sources say 1668) - and weighed 9cwt, 10cwt and 11 cwt respectively. The fourth was also by Henry Knight, made in 1670, weighing 12 cwt. The fifth was made by Henry Knight, also in 1668/9, and weighed 14cwt. It had had the same inscription as the 4 mentioned above, but had been recast in 1903, by Mears and Stainbank at the Whitechapel Bell Foundry. The tenor (F sharp) was a little later than the others, being inscribed "Samuell Knight Made Mee 1688", and bearing the names of the Churchwardens, J Abeare and W Dearing. It weighed 16Â¾ cwt. Henry and Samuell Knight were bell founders from Reading. There was a devastating fire, started deliberately, on June 1st 1914, which burnt so fiercely that the bells were destroyed. The bent clappers were recovered and hang on the tower wall, whilst from the salvaged bell metal was cast the small bell that hangs there - the rest was used to make medallions presented to the bellringers of the time. Similarly styled medallions were also sold as a way to raise funds for the rebuilding of the church. 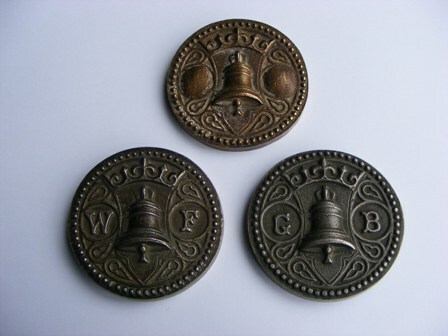 The two at the bottom are made of bell metal salvaged after the fire, and presented to bell ringers of the time - William Fuller (left) (who was the foreman bell ringer) and George Bayliss (right). The one at the top is one of those made for fund raising, and made from more 'brassy' coloured metal, and inscribed on the back 'WARGRAVE CHURCH BELLS 1914". Mears and Stainbank were then consulted by the architect, G H Fellowes-Prynne. They reported that the space of 14'0" by 14'0" was just sufficient to accommodate 8 bells on a level, with a tenor of 17cwt. They considered "this would make an exceedingly fine peal in the key of E, in every way suitable for the tower. The report continued to recommend "a light deadening floor a few feet below the bell floor, to prevent the sound being overpowering in the Church, and to the ringers." They then quoted for 8 bells, 'of best bell metal, perfect in tone and tune - and with perfectly concordant harmonics', totalling 74cwt. They also would install 8 sets of ringing fittings on a frame work of 'best tough iron, cast in sections, accurately fitted together, all joints secured with massive steel angles and bolts, the whole securely bolted to a massive foundation of rolled steel joists. Mears and Stainbank estimated to erect the frame in the tower, hang the 8 bells ready for ringing, including bellhangers time, journeys, carriage 'and all charges' totalled of Â£750. This sum would vary, depending on the actual weight of the bells once tuned, and eventually came out at Â£713/6/8d. Tenor 17Â½ cwt E "To the glory and praise of God. Saved yet so as by fire"
7th 12Â¾ cwt F# "Let him that heareth come"
6th 10 cwt G# "Rejoice with them that do rejoice and weep with than that weep"
5th 8Â¾ cwt A "Fear God. Honour the King"
4th 7Â¾ cwt B "In this place will I give peace"
3rd 6Â¾cwt C# "My lips shall praise Thee"
2nd 5Â¾ cwt D# "Glory to God in the Highest"
Treble 5Â½ cwt E "On earth, peace, goodwill towards men"
Five of the bells (7,8,6,5,1) in the "up" position, ready for ringing. The bells are set out in the frame so that 4 swing north-south, and 4 swing east-west, to reduce the load on the tower walls. (Numbers 2,3,4 are missing from the lower edge of the above photograph) The rebuilt Church was consecrated on July 22nd 1916. The bells are also used to ring the hours and quarters, with separate spring loaded hammers controlled from the clock in the ringing chamber. 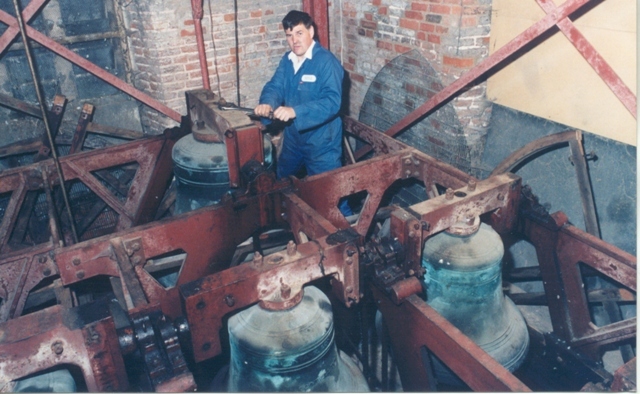 Three of the bells in the "down" position, under maintenance. Wargrave church also has 24 other bells - 2 sets of hand bells. Small bells had been used long before large bells put in towers, and can be seen in ancient Roman or Chinese illustrations. Now they are a popular way for ringers to practice the changes without 'annoying the neighbours'! Rob also explained that bell ringing is 'music', and described the art of 'ringing the changes'. The next meeting takes place on Tuesday, February 14th, when Marion Pope, will recount her Memories of My Time in Wargrave - from Scouting to the Bowls Club, and her long service on the Parish Council, whilst on Tuesday, March 13th, the Society will hold its Annual General Meeting, and announce the programme for the coming year. The meetings start at 8pm in the Pavilion, on the Recreation Ground.